The pair fell sharply in early European trading on Thursday and fully reversed previous day’s recovery, as renewed risk-off mode on Huawei CFO boosted yen. Fresh weakness penetrated daily cloud after cloud top contained dips in past two days. 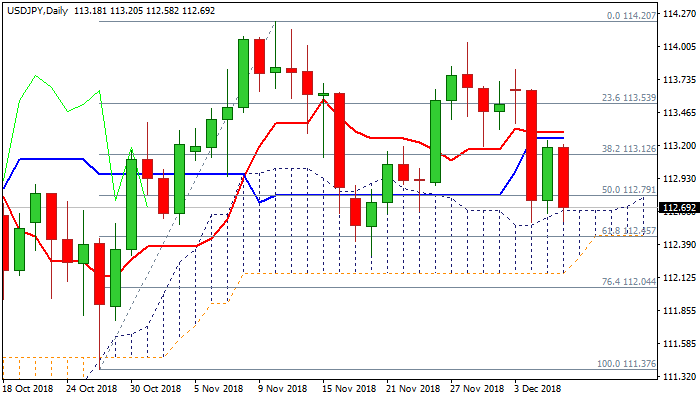 Bearish daily techs lack momentum that could result in repeated hesitation to clearly break into cloud and expose key supports at 112.30/24 zone (daily cloud base/20 Nov trough/100SMA), break of which would generate strong bearish signal on completion of failure swing pattern on daily chart. Conversely, repeated close above daily cloud top would keep the pair in extended congestion as long as a cluster of daily MA’s (between 113.05 and 113.32 caps). Sustained break above 113.32 (converged 10/20SMA’s) would neutralize downside risk and generate bullish signal.